Over more than six decades and 200 films, movie villain John Carradine defined the job of the character actor, running the gamut from the preacher Casey of "The Grapes of Wrath" to his Count Dracula of "House of Frankenstein" and "House of Dracula". 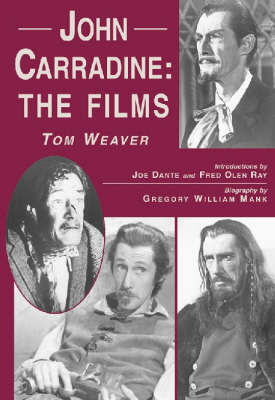 This volume is devoted to Carradine's films. In addition to a comprehensive filmography, there is a biography of Carradine (contributed by Greg Mank), commentary on the man by indie film director Fred Olen Ray, and a piece by director Joe Dante, who writes about Carradine's involvement in Dante's 1981 werewolf movie, "The Howling".